SQA: " could we stick to what Pakistan is doing well instead of India's shortcomings life goes on with or without India"
The subjects include personal activities, education, South Asia and South Asian community activities, regional and international affairs and US politics to financial markets and beyond. You think this is due to FTA with China and wiping out of pretty much all of Pakistan's non defence related light and heavy industry as a result ? Why isn't the Indian or PR machine active in this case? The primary cause of decline of India's exports is Petroleum products and it is for the same reason why India's imports has also declined, that is, the falling price of Oil. As a result there is no big impact on Forex reserves. The good thing is that India's exports of value added exports has increased, be it in Pharmaceuticals or Cars. James: "Why isn't the Indian or PR machine active in this case?" Eric Schmidt spoke Wednesday at the American Enterprise Institute, a conservative think tank. Schmidt said he believes the United States is better off having more immigrants, not fewer, but he particularly is focused on allowing more immigrants into the U.S. with specialized technical skills. Sunil: "You think this is due to FTA with China and wiping out of pretty much all of Pakistan's non defence related light and heavy industry as a result ?" No, it's because of energy crisis that many industrial units, Twariqi steel mill and fertilizer plants among them, have been forced to shut down. Hopefully, the LNG deal with Qatar and lifting of Iran sanctions will help alleviate this crisis. Unlikely LNG is normally 2 times more costly than piped gas in the international market.Why do you think the EU has not been able to break Russia's stranglehold? Also Iran is India's strategic partner.It has the world's largest gas reserves but because it can't build pipelines to Europe(Because of Turkey's informal understanding with GCC) and can't compete Geographically with Russia for supplying gas to China(Siberia being contiguous and practically next door) it basically has only India as a large enough market (200 Bcm/year requirement by 2020) where it can build undersea pipelines. Its oil wells are all in later stages and output will stabilize around 5 million bpd out of which 2-3 million will be required domestically. Without disclosing too much,I would just say its long term strategic interests allign with India and unless Pakistan somehow improves its relations with India it is being encircled. I would say Pakistan has maybe a 5 year window to get its act together. Anon: "Unlikely LNG is normally 2 times more costly than piped gas in the international market." Not any more. Global LNG glut is much worse than the oil glut with more and more supply coming online and demand not increasing much. Russia needs Western Europe more than Western Europe needs Russia as far as energy is concerned. In this environment that favors buyers, Pakistan has struck a good bargain with Qatar. Anon: "(This is Iran's official PressTV btw)"
PressTV has very low credibility. Calling Iranian Navy indigenous and powerful is ludicrous. It's badly depleted after years of sanctions. And it's unlikely that Iran can rebuild quickly given the low hydrocarbon prices. Don't read the US press look at the deliveries. Has there been a substantial increase of LNG supply to Europe?Has there been any new LNG terminals brought online outside Spain(Which is not well connected to the rest of the EU gas grid). Why do you think the EU is dragging its feet on more sanctions on Russia? Anyway I suggest Pakistan gets its act together in the next 5 years or else its all over. I am not hopeful but miracles have happened in other places.Lets see what happens. Anon: "Don't read the US press look at the deliveries. Has there been a substantial increase of LNG supply to Europe?Has there been any new LNG terminals brought online outside Spain(Which is not well connected to the rest of the EU gas grid)." What do you think Russia is going to do with its gas? Ship it elsewhere? Russia is heavily dependent on gas revenues. Its economy is shrinking. It's in deep trouble. Samant: "Yeah slaves, those slaves are going around US and are having a good time :) slaves are also buying thier own houses there. Lolz"
That is the latest from the World Bank. Although India's service exports went up in 2015, goods exports went down due to slowdown in EU. Samir: "The data above is from WORLD BANK showing exports of GOODS & SERVICES. " India's IT services exports are highly inflated and misleading. 'In theory, India follows what is known as BPM 6 (MSITS) reporting method for software and information-enabled technology services (ITES) which counts sales to all multinationals, earning of overseas offices, salaries of non-immigrant overseas workers as India's exports. In practice, India violates it." Samir: " how does India manage to grow it's ForeX reserves year after year - now at $360 billion"
Let's talk about the US part of it. 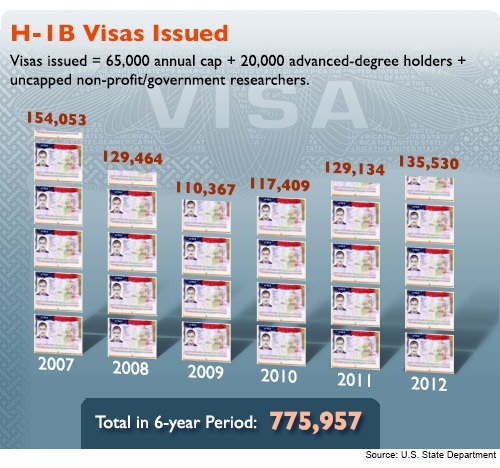 The Indian H1B visa holders make up over 80% of the visa issued each year. These workers renew their visas each year and live and work in US for many many years after arriving in this country. US Center for immigration studies estimated there were 650,000 H1B workers in the US in 2009, a number that is sure to have exceeded a million H1B visa holders in America by now. The BPM 6 (MSITS) reporting method allows for inclusion of their pay only in the first year as H1B worker in this country, not for subsequent years. India violates this rule and continues to add up their salaries into its export earnings for many many years after they arrive. So, lets say there are conservatively 600,000 Indian H1B workers in the US each being paid conservatively $80,000 a year. This adds up to $48 billion from US alone. This amount should be counted as part of remittances from overseas workers, not as IT exports for the year. Why is India complaining this with WTO? US H1 B visa fees are local US laws. sundar: "Why is India complaining this with WTO? US H1 B visa fees are local US laws." Any efforts to make H1B visa difficult or expensive has a direct impact on Indian body shops like Infosys and Tata. It could cut directly into the cumulative H1B worker wages that India counts as its IT exports. That's not my point, if you read carefully. India has no legal standing to complain in WTO. Visa fees decision is US. WTO is the front channel, which is not of any use. The lobbyist will take care of this, once Hillary is in power. These sarcastic coolie remark are partly true, but only for a short time. All work crazy hard, many soon employ Americans with their own startups. No wonder Indians are looked up to here. (with very little racial bias). Pakistanis get a free pass for looking same. r_sundar: " No wonder Indians are looked up to here. (with very little racial bias)." Xenophobes in America do not differentiate among people of color in their hatred toward foreign-looking persons. The current debate against H1B is aimed mainly at Indians, particularly the Indian body shops like InfoSys and Tata, who are the biggest abusers of the program. There are several lawsuits pending in courts to address it along with the growing political opposition to it in US Congress. Only losers will fall for the Xenophobes, always playing the victim card. Have the guts to post my postings - else accept defeat. sundar: "Only losers will fall for the Xenophobes, always playing the victim card." That is to not unexpected from someone of Indian origin given the fact that INDIA IS THE WORLD'S MOST RACIST COUNTRY, according to a World Values Survey. India is a country where caste-based Apartheid is widely practiced with 250 million of its Dalit citizens as the world's most unfortunate victims. Well you call them "Indian Coolies" but do you know the situation of many Pakistanis in GCC. According to the International Organisation of Labour, Pakistan is the second among South Asian nations sending migrant workers abroad. Nearly 7 million Pakistanis have left the country in recent years for the purpose of finding a job and 96 per cent of them make their way to the GCC countries, closely followed by Saudi Arabia. Once in Saudi Arabia or Dubai or Abu Dhabi, theirs is a grim reality. The kifalah system of sponsorship that gets them there insures that they are already deeply in debt before they ever start working. As has been reported in a recent front page story in the New York Times, the Pakistani workers usually do menial jobs in construction, garbage disposal, cleaning, ground crews and such. They live in labour camps in deplorable conditions, sometimes 10 or 15 in a single room, with any clothes they may wear and any food they may eat crammed in between the bunks. Often, employers refuse to pay them, or pay them months after they are due. The recruiters to whom they owe money take anything they get, before any money can be sent home. If they complain too much, there is always the prospect of arrest. They receive no legal advice, no lawyers and no leniency. Punishments are the only certainty. What is the Pakistan Government doing about that? FireSnap: "What is the Pakistan Government doing about that? " There are a lot more Indians suffering worse treatment than Pakistanis in GCC nations. What is Indian govt doing about that? What can it? It depends on them for vast amounts of foreign exchange. The country sending the largest remittances to India is UAE ($13.2billion) followed by US and Saudi Arabia ($11 billion each) and Pakistan ($4.9 billion). "#India's population explosion will make or break its economy." As far as I know, India's population growth rate is lesser than Pakistan. Moreover, through United Nations Fertility Variant, it will start declining after 2060. For skill development, I know that manpower is emerging faster than jobs. And that's why Govt. has launched standup India program a few days ago to create industrialists. Case of catching up with quality, Indian Institutions are catching up and will achieve with time (I'm myself connected to this sector). Can you tell where does Pakistan stand here. Your country's literacy must be greater concern for you. MoA: "Case of catching up with quality, Indian Institutions are catching up and will achieve with time (I'm myself connected to this sector). Can you tell where does Pakistan stand here. Your country's literacy must be greater concern for you. " First, let me respond to your concern for Pakistan. Yes, the literacy rate is a concern of mine too. It needs to rise faster than it is. But your assertion about India "catching up with quality" does not appear to be supported by evidence. Currently only 2% of India's workers have received formal skills training, according to Ernst & Young. That compares with 68% in the U.K., 75% in Germany and 96% in South Korea. Indian kids rank near the bottom on international standardized assessment tests like PISA and TIMSS. Pakistani kids are doing better than Indian kids on both math and verbal tests, according to a World Bank report. Pakistan's grade 5 and 8 students outperform their counterparts in India, according to the World Bank report titled "Student Learning in South Asia: Challenges, Opportunities, and Policy Priorities"While 72% of Pakistan's 8th graders can do simple division, the comparable figure for Indian 8th graders is just 57%. Among 5th graders, 63% of Pakistanis and 73% of Indians CAN NOT divide a 3 digit number by a single digit number, according to the report.. The performance edge of Pakistani kids over their Indian counterparts is particularly noticeable in rural areas. The report also shows that Pakistani children do better than Indian children in reading ability. What are the reasons behind this slow growth? What are the reasons behind this slow growth?" India launched in 2008 while Pakistan did in in 2014, a six year gap. It's pretty obvious given the fact that most of the Internet access in South Asia is via 3G/4G that rolled out in Pakistan much later than India. Over the last two years since the 3G 4G rollout, Pakistan has experienced tremendous subscription growth to 26 million users in Feb 2016, much faster than the growth rate in India. Never the one to shy away from putting things bluntly, Republican presidential frontrunner Donald Trump has expressed his displeasure at India's outsourcing industry by impersonating a call centre representative in India. However, just moments later, he goes on to call India a great place, asserting that he is not angry with Indian leaders. At a campaign rally in Delaware, the billionaire from New York said that he called up his credit card company to find out whether their customer support is based in the US or overseas. "Guess what, you're talking to a person from India. How the hell does that work?" he told his supporters. "So I called up, under the guise I'm checking on my card, I said, 'Where are you from?'" Mr Trump said and then he copied the response from the call centre. "We are from India," Mr Trump impersonated the response. "Oh great, that's wonderful," he said as he pretended to hang up the phone. "India is great place. I am not upset with other leaders. I am upset with our leaders for being so stupid," he said. "I am not angry with China. I am not angry at Japan. I am not angry with Vietnam, India...all these countries." Mr Trump mentioned the fake call to India during his remarks on what he described as "crooked banking". Delaware, is a hub for the America's banking and credit-card industry. Topping the list include Bank of America, Citibank Delaware, M&T Bank and PNC Financial Services Group. "They are making a lot of money," he said. "You can't allow policies that allows China, Mexico, Japan, Vietnam, India. You can't allow policies that allows business to be ripped out of the United States like candy from a baby," Mr Trump said in his address. "The manufacturing jobs are being stolen. Our jobs are being taken. We are losing at every front. There is nothing good. Our country does not win anymore. The jobs are being stripped. Factories are closing. We are not going to let this happen anymore," he said. Mr Trump said he has as many as 378 companies registered in Delaware, where the Republican presidential primaries is scheduled on April 26 along with several other states. He is leading in polls against his other primary rivals. In his speech, Mr Trump praised Delaware's status as a tax shelter and slammed President Barack Obama for not using the term "radical Islamists" in the fight against terrorism. "I want to run against crooked Hillary," he said, reiterating that a Trump vs Clinton race would bring the greatest turn out in the history of the American elections. "We will stomp on Hillary Clinton no one's ever done." He was also critical of Indian-American South Carolina Governor Nikki Haley, who did not endorse him during the primary. In the wake of a report that the U.S. crackdown on the controversial H-1B foreign-worker visa is falling more heavily on Indian citizens, a staffing and outsourcing company filed a lawsuit against the federal government claiming an Indian worker was illegally denied an H-1B visa. Krishnamurthy had worked for Stellar under the H-1B visa for nearly seven years until the end of May, the lawsuit said. Stellar supplies workers and software services to clients. The H-1B, obtained by employers, is intended for highly skilled workers doing specialized jobs, and the visa has become a flashpoint in the immigration debate. Supporters, including many of Silicon Valley’s largest technology companies, have lobbied for an expansion of the annual 85,000 cap on new visas, arguing that companies need to be able to bring in the world’s top talent. Critics point to reported abuses, mostly by outsourcing companies but also by UC San Francisco and Disney, and assert that H-1B holders take jobs from Americans. 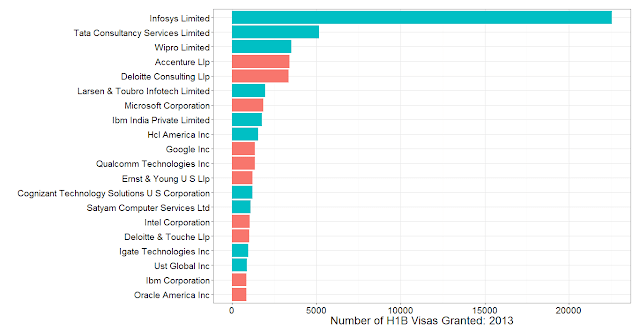 Though the H-1B can be a path to a green card, many who hold it spend years or even decades on repeated visa extensions because of the processing backlog for green cards. The problem for Stellar and Krishnamurthy started in August 2017 with a request for a visa extension. That’s when the company and the worker ran into the H-1B crackdown that arose from President Donald Trump’s “Buy American and Hire American” executive order. Federal authorities appear to be focusing H-1B enforcement efforts on staffing and outsourcing companies providing foreign workers to U.S. firms. Late last year, federal authorities began ramping up their rate of visa denials and requests for evidence that a requesting company, worker and job match the visa requirements, a report said earlier this year. And applications for Indian workers were more frequently subjected to the “requests for evidence,” according to the report by the National Foundation for American Policy. Citizenship and Immigration made such a request regarding Krishnamurthy’s proposed H-1B extension, telling Maryland-based Stellar it had until April 17 to respond, the suit said. But almost a month before that date, the agency denied the extension, the suit claimed. Stellar’s request that the agency reconsider the decision was denied, according to the suit, filed Tuesday in U.S. District Court in Washington, D.C.
Federal officials cited a lack of evidence concerning the “end-client’s” workplace where Krishnamurthy would be placed, and contended that Stellar hadn’t proved it would supervise his work at the third-party site, the suit said. Stellar argued that a letter from Honda of North America submitted to the agency as evidence “completely refuted” the contention that not enough evidence was supplied about Krishnamurthy’s planned workplace. And two U.S. Supreme Court decisions, plus the agency’s own Adjudicator’s Field Manual, impose a requirement that a company must have the right to control an employee’s work at a client site, but whether it exerts actual control is irrelevant, the suit said. The lawsuit seeks a court order overturning the visa denial. US Citizenship and Immigration Services (USCIS) director L F Cissna has said that he could draft a provision immediately that prohibits H1B visa workers from replacing American workers if the US Congress passes it. Speaking at Immigration Newsmaker conversation event on August 15, L F Cissna strongly advocated for a stricter provision preventing American workers getting replaced by H1B visa holders. “I would really love it if Congress would just pass a one-sentence provision that would just prohibit American workers in being replaced by H-1B workers. I could draft it myself, you know, probably right now, you know? It’s – those are the things off the top of my head,” he said at the event. H1B visa is quite popular among Indian IT professionals. The USCIS returned all petitions of H1B visas in April that were not selected through the computer-generated lottery system. The H1B visa is a non-immigrant visa that allows foreign workers with specialisation to work in American companies. US technology companies rely heavily on workers from India and China. “There’s little tweaks we could make to the way we administer, say, the H-1B program to possibly, you know, make – improve the chances of U.S. educated students getting a better shot at an H-1B visa, maybe. (sic),” L F Cissna said, adding that there are highly skilled US-educated foreign students who a US employer wants to hire.